Several months ago, at the girls' request, I made a sleeping bag for their doll Peanut. It was not fabulously sewn, was in clashing colours, and was made with supplies I had laying around the house (including a zip that was too short). The girls have enjoyed it, and it's seen plenty of use. 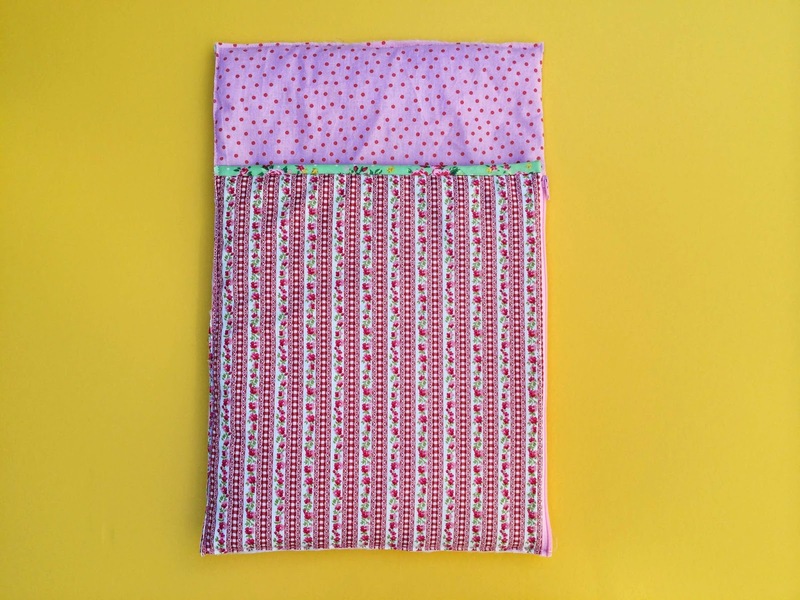 About a week ago a reader asked me if I would post a tutorial on how to make this sleeping bag. I figured it was a good opportunity to make it a bit better. Bias Tape - I cut 1.5" strips, which gave me 0.75" wide tape. You'll need enough tape to go around the whole sleeping bag. This pictures shows 0.5" single fold bias tape, but I decided not to use it as it was too thin. Zip - minimum 12" zip. I used a regular dressmaking zip. Wadding/batting - two pieces cut to the following measurements 16.5"x11" and 12.5"x11". I used a high loft batting to give the sleeping bag a nice, puffy look. Outer fabric - two pieces cut to the following measurements 16.5"x11" and 12.5"x11". I used a cotton fabric. 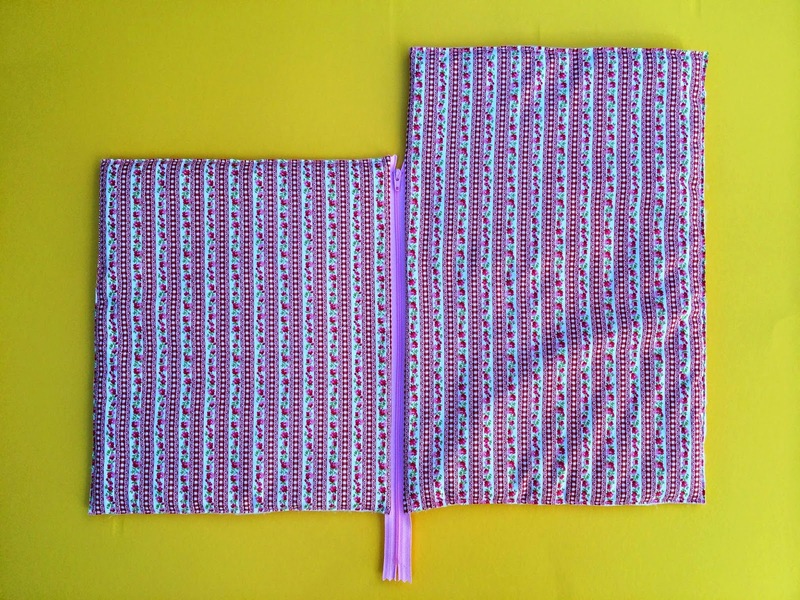 Lining fabric - two pieces cut to the following measurements 16.5"x11" and 12.5"x11". Again, I used a cotton fabric. 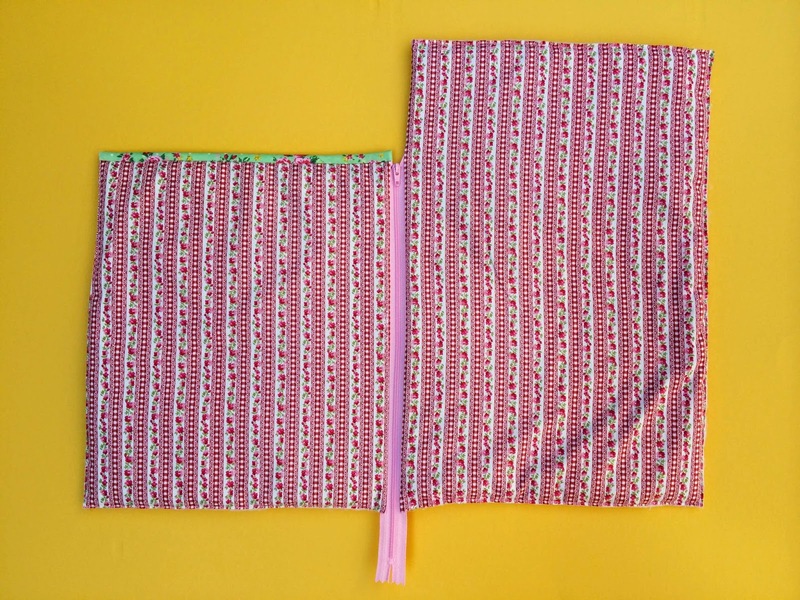 The larger fabric and batting sections are the back of your sleeping bag, and the smaller fabric and batting sections are the front of the sleeping bag. Start with the smaller pieces of outer fabric, lining fabric and batting. Pin these pieces to your zip as shown above, with the RS (Right Sides) together. 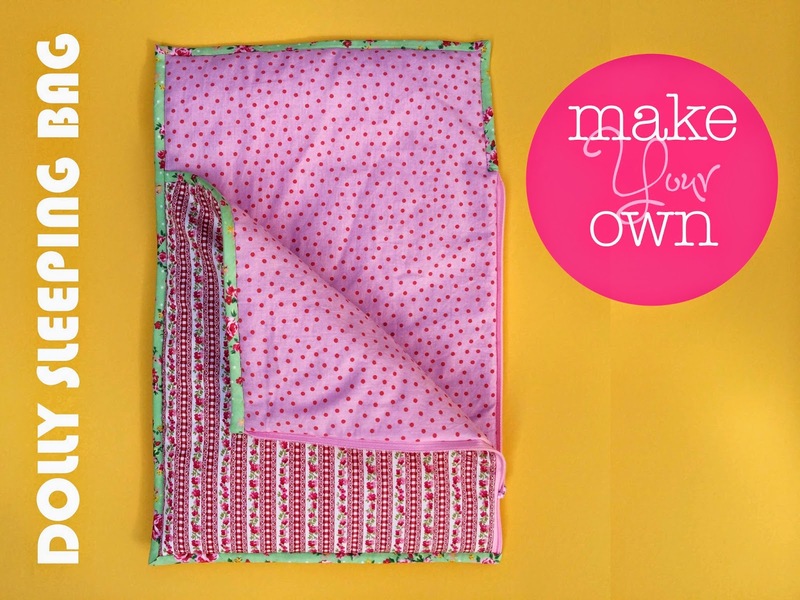 The spotty fabric is the lining and the striped fabric is the outer fabric. In the above picture the zip is placed wrong side up, and you are pinning to the right-hand side of the zip tape. Ensure you align the top of the zip, with the top of the fabric. Just let the excess zip hang out the bottom. 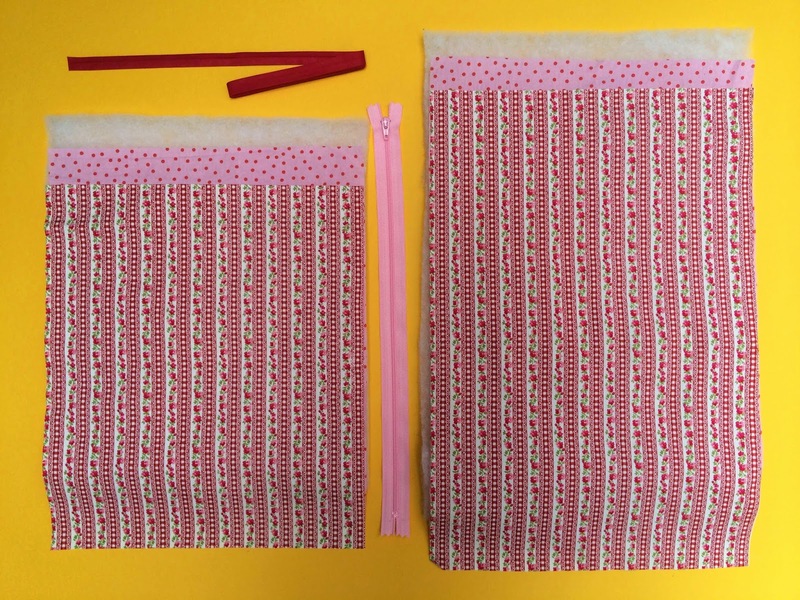 Sew along the length of the zip to secure the layers together. Trim as much of the batting as you can from the seam allowance. This will help give you a flat, even seam when you turn the fabrics out the right way. Turn the fabrics out the right way, and baste very close to the edge all around the fabric. If you prefer, you can top stitch the zip. I just pressed it. In the above picture the RS (Right Side) is the outer fabric, and the WS (Wrong Side) is the liner fabric. At this point you should trim any messy bits of fabric and batting around the outside edge. 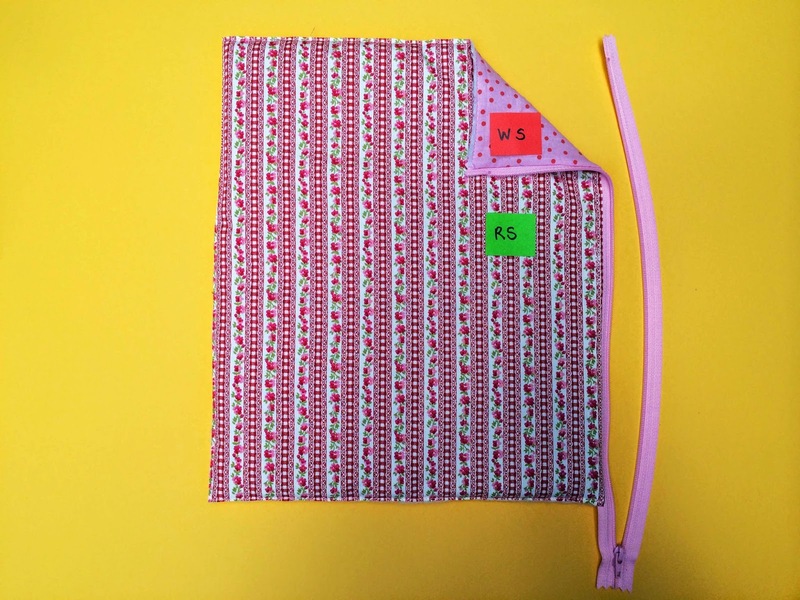 You will now sew the larger pieces of outer fabric, lining fabric and batting to the other side of the zip. This time the zip is placed right side up, and the fabric is pinned to the right-hand side of the zip tape. Your fabrics should be placed right sides together as shown in the picture above (outer fabric on top, lining fabric in the middle and batting at the bottom). The zip sits between the outer fabric and the lining fabric. 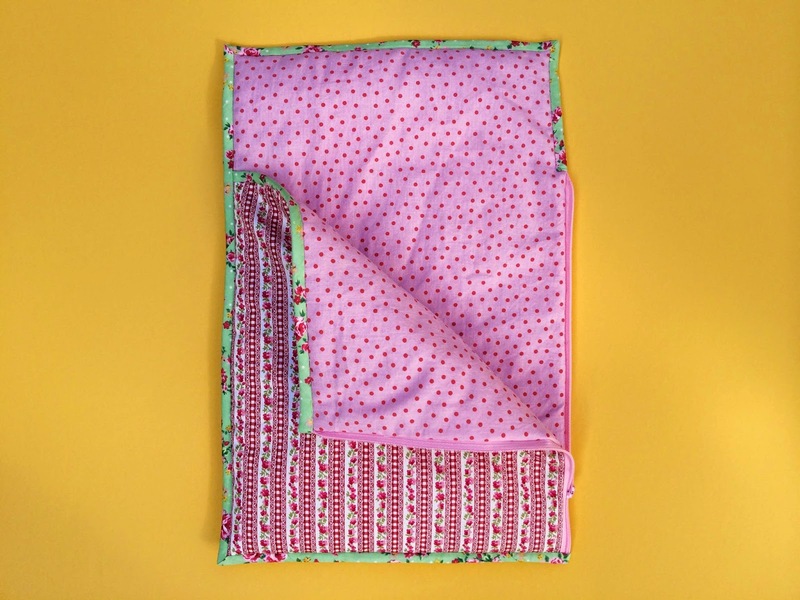 It is very important that you carefully line up the bottom edges of the fabric so the zip is in the same position on both the front and back of the sleeping bag. Sew along the whole length of the pinned seam and trim the excess batting from the seam allowance. Turn the fabrics out the right way, and baste very close to the edge all around the section. Again, if you prefer, you can top stitch the zip. I just pressed it. You now have the main body of the sleeping bag attached to the zip. The next step is to add the bias tape. Sew bias tape along the top edge of the smaller section. I carefully wrapped the end of the bias tape around centre edge (and zip), and sewed it very neatly. My preferred method for attaching bias tape very neatly, is to machine sew the first edge, then turn the tape over and hand sew the back edge. I can do bias tape on the machine, but I find I spend more time unpicking it and trying to correct messy sewing. It's usually much faster if I just do the second seam by hand. Hand sew a bar tack (or machine sew if you prefer) on the bottom of the zip, just a tiny bit above the bottom edge of the sleeping bag. Cut off the zip in line with the bottom edge. You can now fold your sleeping bag with the lining sides facing each other, and baste the two sections together (see picture above). Stop and give yourself a pat on the back - you almost have a finished sleeping bag. I like to unzip and zip it up a few times, just to remind myself how clever I am! To finish the sleeping bag, we just need to add the bias tape edge. Start sewing your bias tape edge from the top of the zip on the back section. 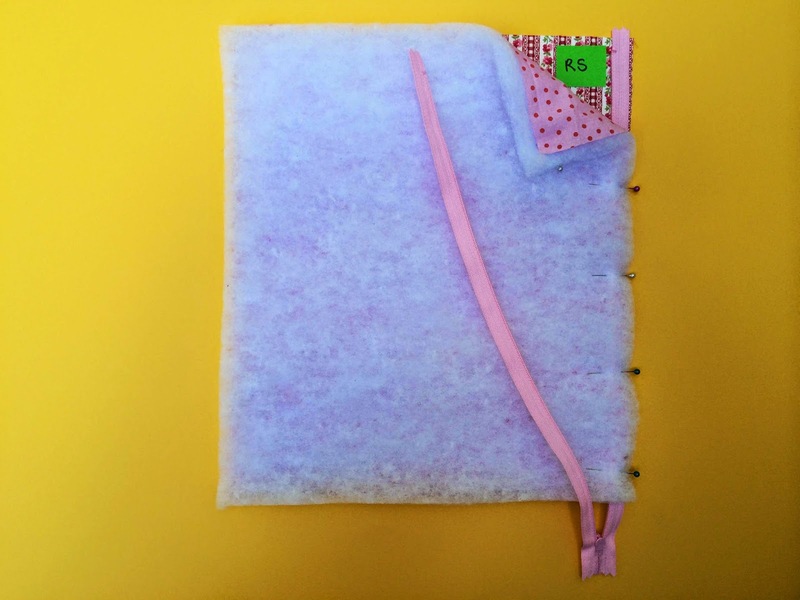 Work your way around the sleeping bag using one continuous strip of bias tape. To do this you will need to make mitred corners. It's a tiny bit fiddly, but does give a very neat finish. Again, I machine stitch the front edge, then I fold the tape over, and hand stitch the back edge. I carefully wrap the bias tape around the zip on that bottom right corner, and sew it securely in place. 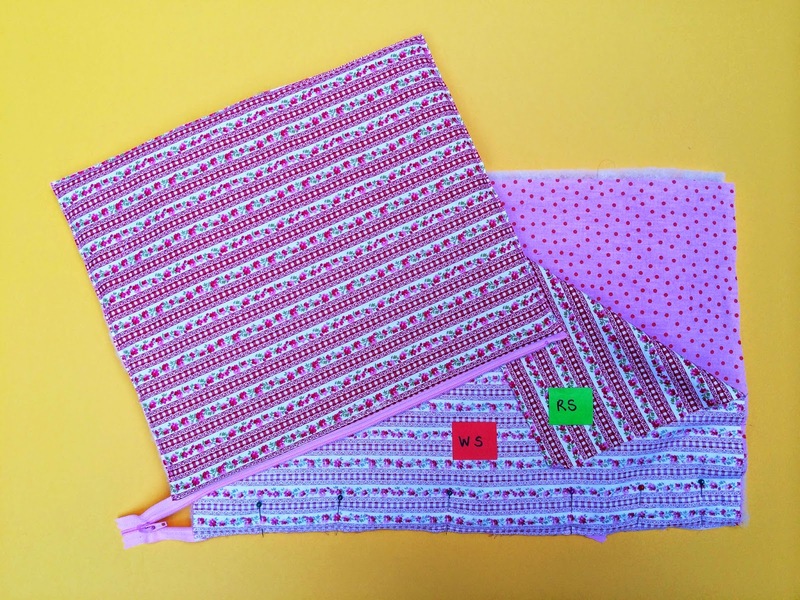 If you prefer, you can cut three rounded corners and sew your bias tape around a curved edge at each corner, rather than having those mitred corners shown above. You'll still need a straight corner on the bottom of the zip. You are now finished. Unzip your sleeping bag, pop dolly inside and let her have a nap. I hope these instructions are clear and useful. I tried to make this tutorial look a bit more professional, and even went so far as to purchase some yellow card as a neat backdrop, although the picture were taken throughout the day, and the light kept changing and making the pictures look different. Any feedback or comments are greatly appreciated. If you have any questions about the method outlined, please let me know. 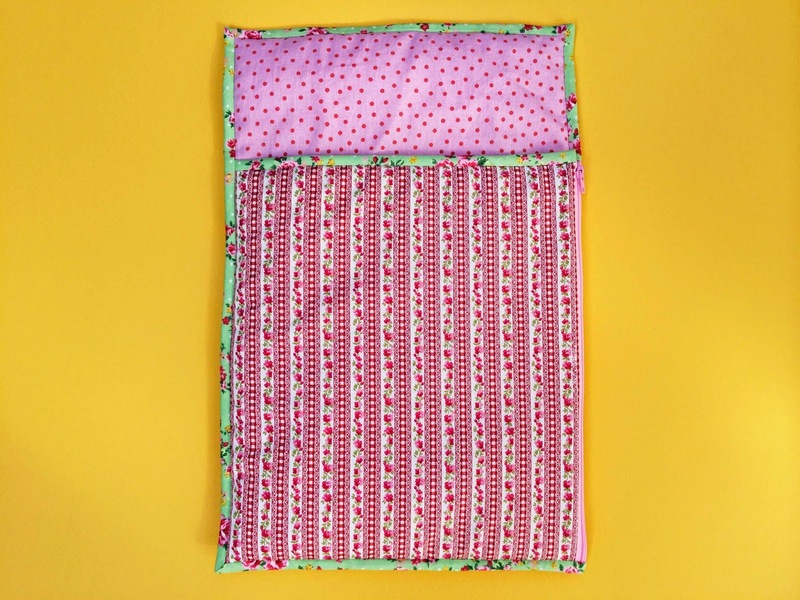 If anyone does make a dolly sleeping bag, please send me a link or photo. I'd love to see your makes.